One of my favorite games on Nintendo's new console is an interactive fireplace. It's an emotional, interactive fireplace. And it's the first console game I've played through without ever turning on the TV. Little Inferno is a download-only game for Wii U and PC/Mac/Linux. It was mostly made by two friends named Kyle and a guy named Allan Blomquist. Separately they led the creations of the acclaimed World of Goo and Henry Hatsworth in the Puzzling Adventure. The former game was a building set, the latter a hybrid sidescroller and block-puzzle game on the other. That these guys made an interactive fireplace is both surprising and not surprising at all. If you look for info on Little Inferno, you find a mix of confusion and acclaim. The confused people wonder if Little Inferno is even a game. The impressed people write about how, as they finished the game, they got choked up. It is a game. It's mostly a puzzle game. You've got a fireplace that you can see on your GamePad screen (or, presumably, on your TV). You've got a catalog of items such as bricks, corn and fireflies in a jar. With the stroke of the GamePad's stylus, you can flick these things into the fireplace. Everything burns. The bricks get crispy. The corn pops. Later, when you burn a railroad crossing sign, a train horn blares, the fireplace shakes and, for a moment, it seems that an unseen locomotive is speeding by. The game has 99 challenges. These are its puzzles, each of them a phrase that refers to two or three items that must be burned at the same time. "Bike Pirate" is a cinch. Burn the wooden bike. Burn the pirate. "Movie Night" is a little tougher. Burn the popcorn. Burn the TV. WHY: You don't already own an interactive virtual fireplace, at least not one with a lovely soundtrack and an emotional story (WHAT?). Type of game: Pyromaniac's delight masquerading as a puzzle game about burning things. Sort of an adventure game. What I played: Solved 77 of the game's 99 puzzles in 285 minutes. Did it all on the GamePad (that's the Wii U controller with the screen in it); kept the TV off. Burning celestial bodies in a fireplace. Tough to say...hmmm...the lack of a turret sequence? I'm coming up empty. Feeling the need to address the "does it cost too much?" concern. "I think this game just criticized how I spend my time, but I still like it." "Best use of fire in a game since NBA Jam Far Cry 2." Everything in the game burns in a visually-interesting and surprising way. The fire effects look great. This alone will emotionally engage any number of pyromaniacs who buy a Wii U or download the game on their computer. The rest of us might be more enchanted by the mysterious letters that begin showing up in the game's inventory. They are intermittently cheerful and sad, a wee bit wicked and increasingly desperate. You might feel a mix of emotions as you play. 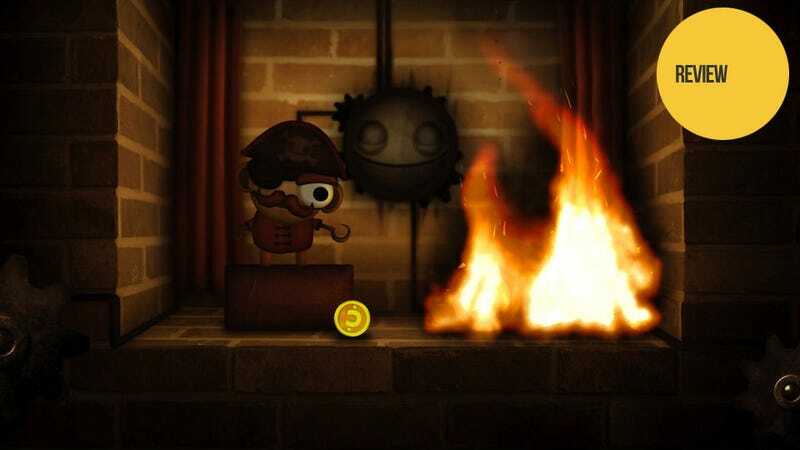 On the one hand you're playing through a game that lets you burn the moon in a fireplace. On the other, you're drawn to these messages from this character who seems to exist beyond the interactive world you thought you were in. Something seems off. There's a hidden truth to the game that starts to matter more and more. Your memory may flicker. You may begin to think of another confidently-made game of puzzles, secrets and unexpected emotions: Portal. You don't want me to tell you any more. There is a debate on the Wii U's social network, about whether this game is worth $15. It's a valid question that can only be answered by those who know what $15 is worth to the person asking. I didn't 100 percent the game, yet I played it for nearly five hours. I didn't get to shoot anyone in it. The game has only one zombie (you can burn him). But it does include a lot of jokes. It has a great soundtrack and a bunch of surprises. It is an interactive fireplace with a wonderful story. Should it cost $10? Maybe. I'd pay full price for it again. The test I want a good game to pass is simple: I want it to stick with me. I want it to seep into my thoughts days after I played it. Little Inferno is simple. It's somehow both quaint and bold. It lingers. It burns brightly. It burns well.